I have said in another post or two that my oldest son bought a 64 Landlord a while back. It had been at my house while we fixed up some things that were wrong with it. I took it to his house on Monday evening. 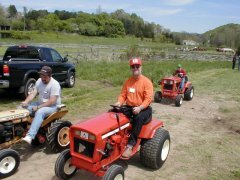 Yesterday he called me and then started the tractor so that I could hear that it started without any choking of the engine, and how good it was running. Today I received an email with the following picture attached. The colors are not too good because it was taken by a cell phone, not a digital camera. I know it looks like dirt, but when I was there Monday it was above my ankles and very thick. The mower is set as high as it will go. Picture just doesn't have good colors. 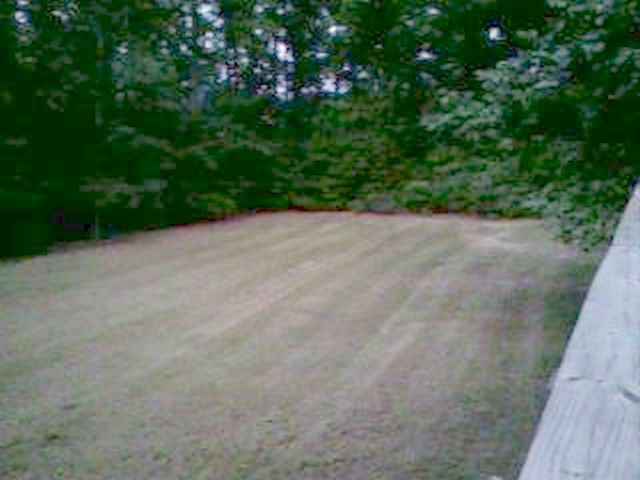 There is also a lot of dry grass chopped up on that lawn that was left in piles from mowing with the box-store mower. He sure seemed proud of those stripes. Said that now he could make his lawn look like a Baseball Diamond. He was also surprised how it went over the rough places and the tree roots without scalping. 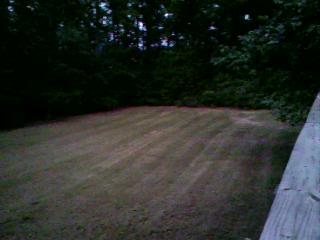 Also, he said it took about half the time with the Landlord that it usually takes with the other mower. Both are 42 inch. Don't think he believed his Dad when I told him about these tractors. Sounds like he is a believer now. He now wants me to give him a front blade to use on his driveway. He has asked to borrow my sicklebar mower. He also said something about a tiller. Have I created a Monster? Guess I now have my oldest son addicted. I see the stripes clearly and they look great....but the color makes it look like he rototilled the whole yard. :D (tell him to send a better picture. :) You did tell him to use the mower deck didn't you? Not the tiller? Erik, It is really the picture that doesn't do justice to the lawn. That is very thick grass, not dirt. The picture was taken at dusk and was very dark. When I lightened it so you could see clearly, it washed out the color of the grass. I'll see if I can get him to shoot a better picture, with a digital camera, not his cell phone. Here is the original picture that he sent. He says most of the tan color is dry grass from previous mowings that was scattered when he mowed. Also the picture was taken around 8:00 PM, with very low light since that whole area is shaded. I know, I know...been there myself - just not with a phone camera! :) Just yankin' your chain a little. :D The stripes look great nonetheless.